I'm back in my same classroom this year, but it got a transformation! A teacher who retired from my building saw my classroom pictures online and asked where I was teaching now! I didn't realize how different the room looked with a few updates! 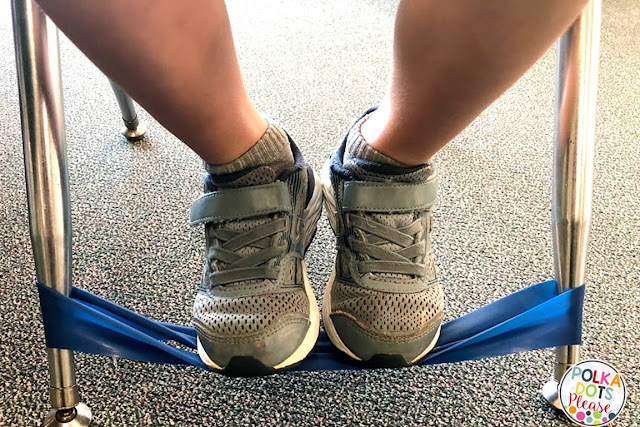 Last year I tried flexible seating for the first time. I learned SO much about how to make my classroom fit the needs of my students and me! Before I started setting up my classroom, I had a vision of what I wanted and needed from our space. I WANTED our classroom to be bright and welcoming. I also NEEDED our classroom to be organized and functional! 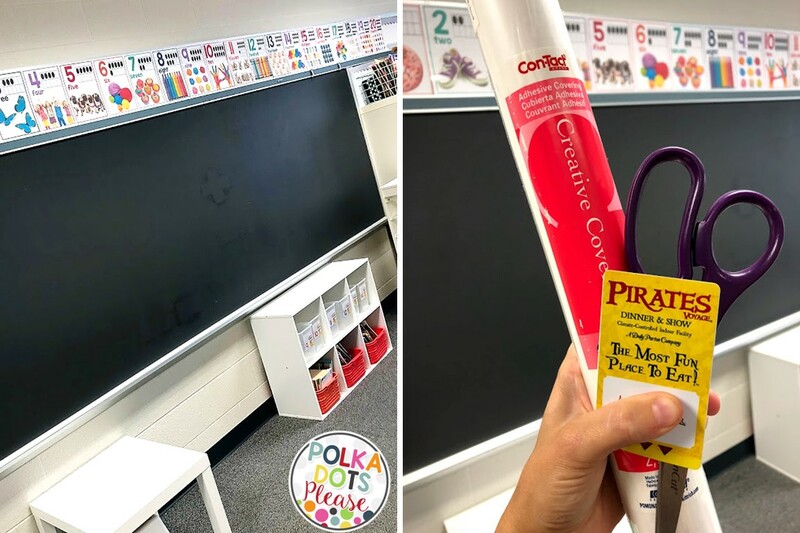 Finding just what you need is important so I included affiliate links if you're looking to find anything for your own classroom. ...and now you can see my covered boards! The back board will be our magnetic word wall. We will be adding words to our wall throughout the year. The front board will be our math and calendar wall. As I was setting up this year, I really needed to consider my curriculum and how I would be teaching. I will be implementing Reading Workshop this year so I needed a lot of open space for anchor charts. My bulletin boards are covered with fabric, but I intentionally left them blank so we can fill them together. Keeping our classroom library organized and functional was even more important this year. We have one library area that is organized by topic, character, genre, etc. Last year I used large Sterilite bins (without the lids) to keep these shelves organized. I needed some more specific labels this year, so I got some smaller clear bins from Target too! Using 2 different sizes of bins works best for the collection of books that I have now. 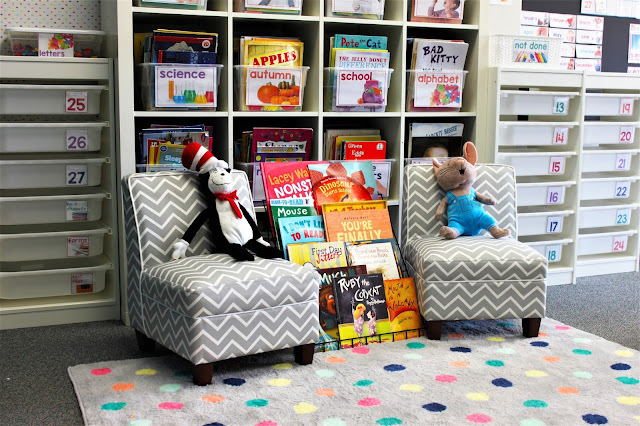 We also have a library area in the front of our classroom that is organized by text difficulty. A few of our bins didn't fit in this area so you may see them tucked in other spots around the classroom. All of these books have matching stickers so we can easily borrow and return books. I added some curtains and plants to this area to make it look more inviting. This is where I will do most of my whole group instruction. 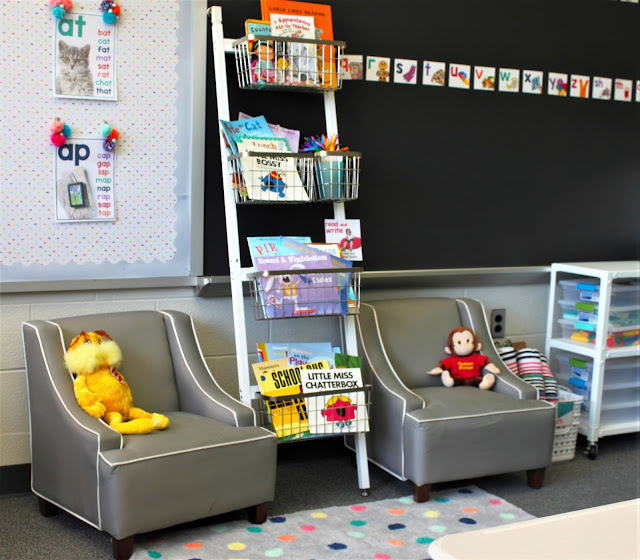 Our favorite read aloud books got a special place in the classroom too! Last year, I had a large table in the front of the room that I used for our community supplies. I moved that table behind our futon this year for extra seating. Our community supplies needed a new home so they moved to a shelf at the front of the room. My firsties share all of things in these bins. My first graders keep their personal supplies (pencil boxes, folders, journals, and math workbooks) in drawers. They keep their books for independent and partner reading in bins. I spaced the drawers and bins out around the room to keep the areas from getting too crowded. My teacher supplies are still organized in Sterilite drawers and a teacher tool box. I sprayed my tool box white to freshen it up! I haven't had a desk in a years, but I still need a place to keep everything. Most of my flexible seating choices are the same this year, because they worked out very well last year. I added a futon and some bands to my chairs, but I still loved everything we had! 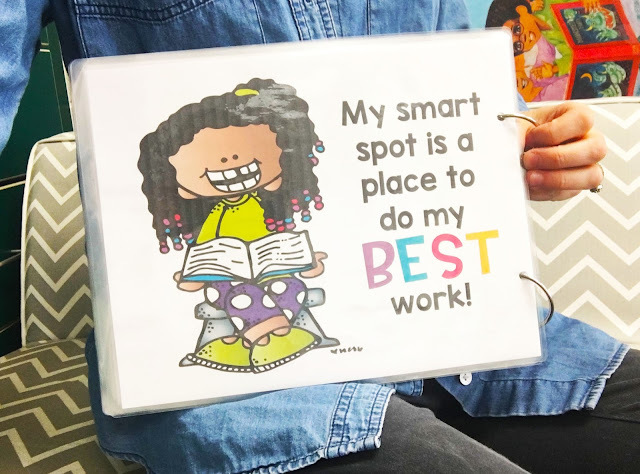 Here are some of the places where my first graders can choose for their Smart Spots to work or read. 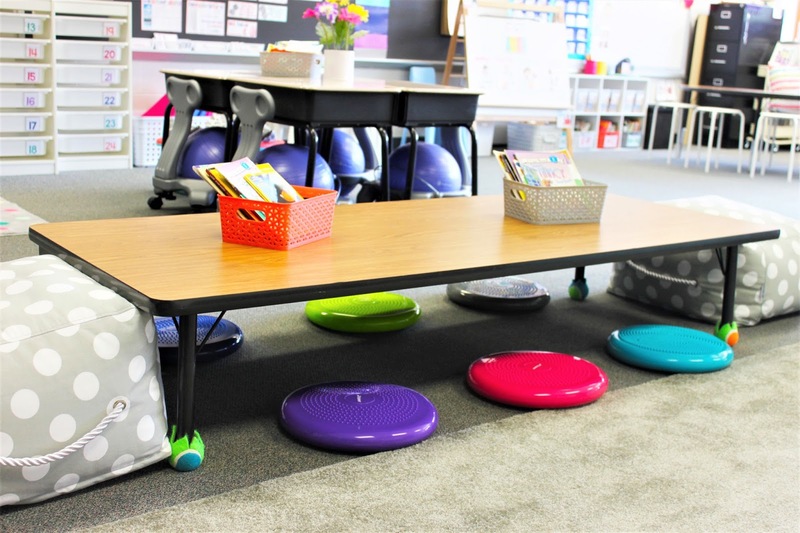 For my secrets to success for flexible seating, click here. The low table is always a popular spot. It can be used with or without wobble cushions. I just removed the leg extensions from a standard table. 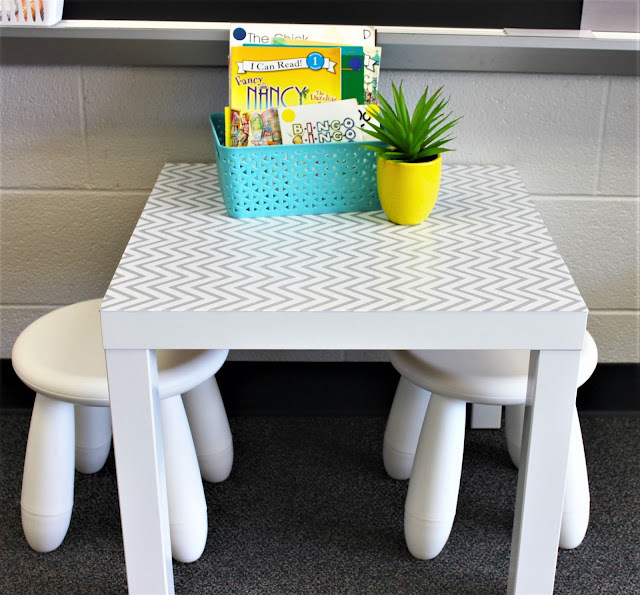 These two little side tables and step stools make a great space for partner work. I have another matching table and stool on the other side of the room. I have 2 tables made from desks in my classroom this year. Each table has 2 ball chairs and 2 regular chairs with Fidgeteez chair bands. Although I have 25 kiddos, I have found that having 4 of each seating choice works well. I was allowed to remove my extra desks this year so I only have 8 desks! This table doubles as a small group table. My stools are from ikea, but I found bright cushioned stools Amazon that I love too! Our classroom futon is perfect for reading and partner work. This specific style is out of stock, but here is a very similar futon from the same company. Our stools from Otto Storage are the best. One is used to store cushions and one is used to store clipboards. They are both used a seats and tables too! There are several cozy chairs in the classroom for reading and working. Our back table has 4 wobble stools and there is a basket of scoop rockers too! 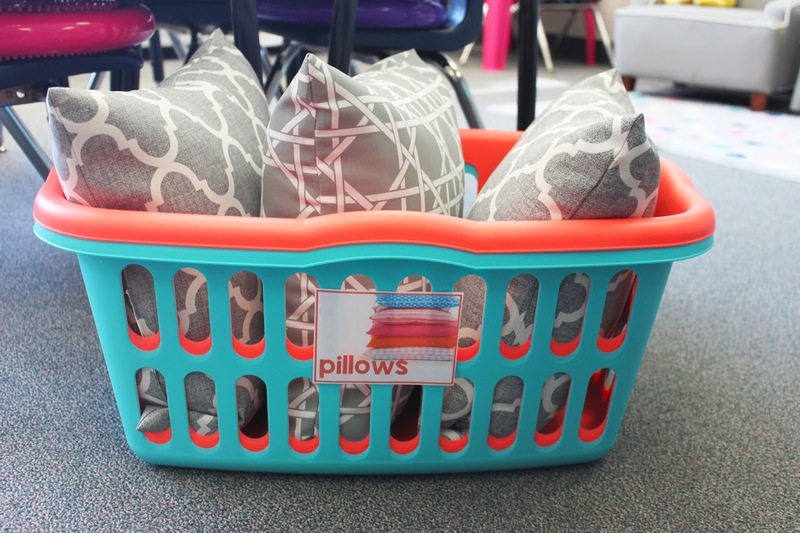 Another corner of the room has a stack of laundry baskets and pillows that are fun for reading! 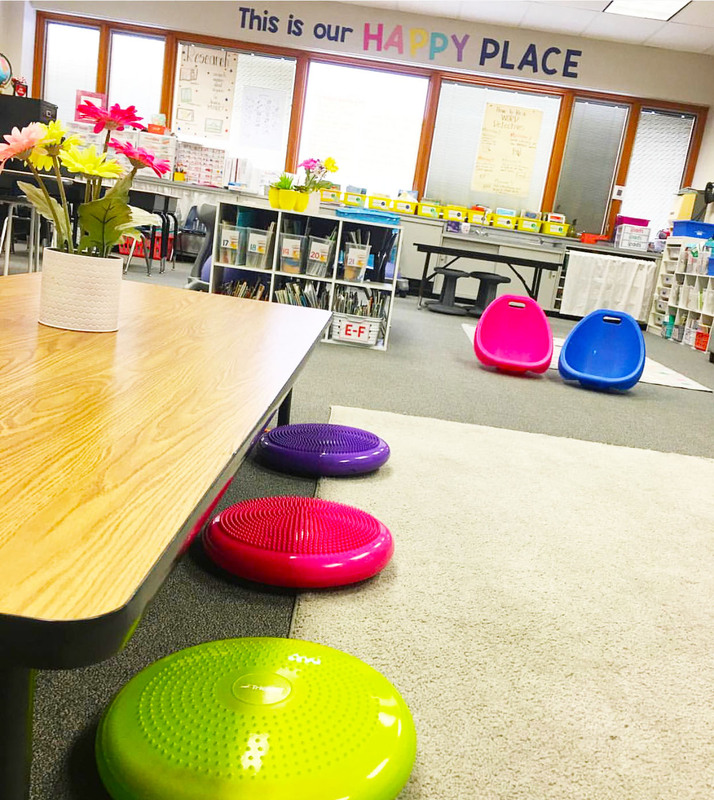 We call our flexible seating choices "Smart Spots." 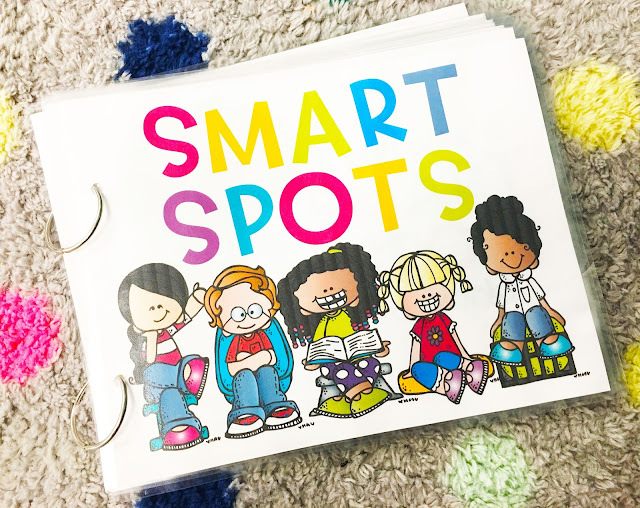 We used our Smart Spots book so much last year that I had my copy made into a book for my classroom. We read it every day for the first week of school, and we will reread it again throughout the year as much as needed. Thanks so much for stopping by our Happy Place! I remember the first time I ever saw a photo of a classroom with flexible seating. I just knew I had to teach in a space like that! 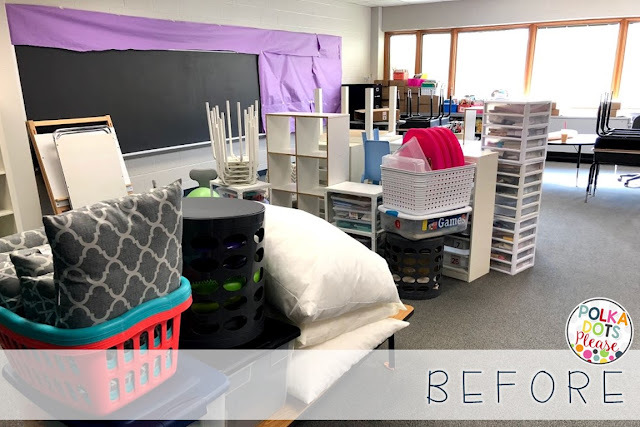 I spent the entire summer getting ready to transform my classroom! ACTUALLY GOING TO MAKE THIS WORK? The night before my kiddos came, I was so nervous. I debated hiding all of my flexible seating options and just using traditional chairs to start the year. I haven't been that nervous since my first year teaching! It took all of my teacher courage to stick with it, but I am so glad I made the decision to be brave and launch flexible seating! Here are 5 secrets to success that made it work! If you've been a teacher for more than 5 minutes, you know the importance of teaching and modeling everything...and repeating the process...and repeating it again! The same is absolutely true for flexible seating! Without modeling and practice, it could be chaotic. After hours of searching on Pinterest, I found lots of cute anchor charts and seating signs, but I could not find what I needed to introduce flexible seating. What I wanted was a big book that would really help me TEACH my kiddos what to do....so I created one. My kiddos fell in love with the idea of Smart Spots. Smart Spots are places they can choose to go to do their best work. The book included expectations for all the different kinds of seats in our classroom. We meet on the rug for whole group lessons, and then kiddos can choose their own Smart Spots for independent or partner practice. For the first couple weeks of school, we read our Smart Spots book EVERY day. It stayed at our literacy center for months, and the kids loved rereading it with pointers! If I ever notice a few kids are not choosing Smart Spots, I get out the book and we read it again. 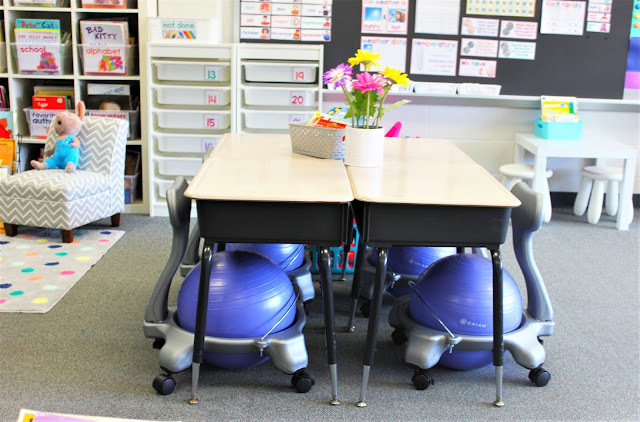 While on Pinterest, I found lots of ideas for scheduling or rotating seating options. 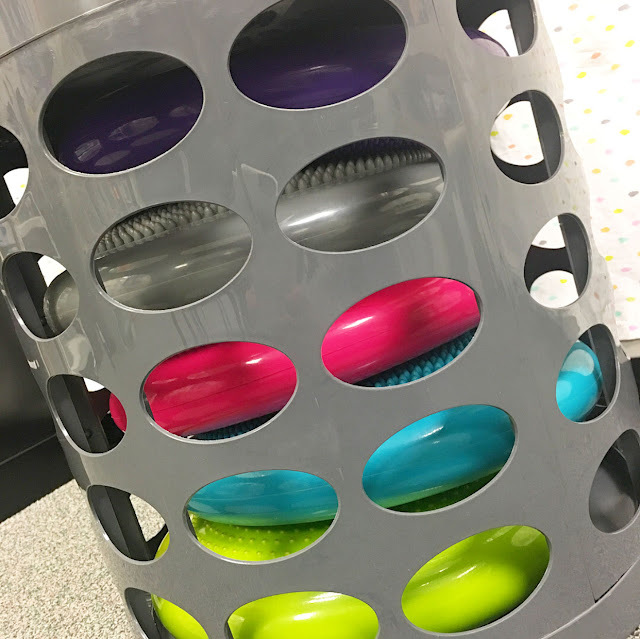 I am impressed by teachers who can remember who sat in a ball chair last Thursday and who had the pink rocker yesterday, but I simply can't do it. For that reason, we don't have any rotation board or schedule. Our seating really is flexible. My first graders pick Smart Spots all day. They sit in several different spots throughout the day, and that's okay with me. I was initially worried that they may race for certain seats, but that hasn't really happened. It's been interesting to see their individual preferences switch from ball chairs, to low tables, to rockers, to baskets and back again. Everyone gets to try everything, and I don't have to organize it! These are some of out favorite spots. You've got kids working all over the room, but you don't want supplies scattered across the floor all day! We have some community supplies and some individual supplies. Each kiddo has their own pencil box and their own bin. Their pencil boxes are filled with pencils, crayons, markers, glue sticks, etc. The outside of their pencil boxes have nametags on them. I always liked having nameplates on desks to reference things, and I didn't want to lose that tool. Now they just carry it with them! Everyone also has a bin. These storage drawers from Ikea were an investment, but I LOVE them! They are extremely durable and easy to use! 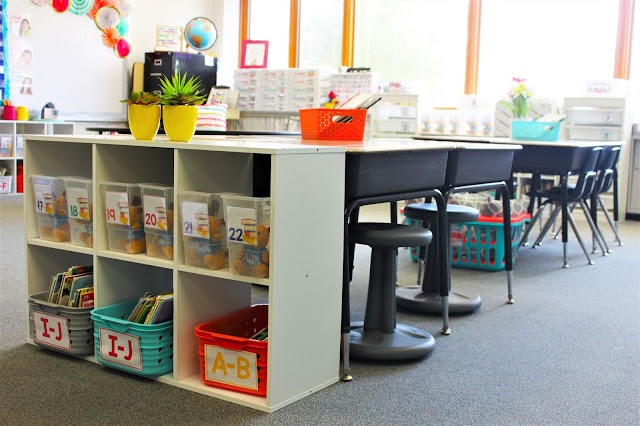 The kids each have a sliding bin to store their journals, pencil boxes, notebooks, folders, etc. At the beginning of the year, I had towers of drawers side by side, but I realized that it gets crowded quickly. I spread the towers out around the room so it's easier to get out supplies or clean up. If your kids have bags of independent reading books, they could keep them in the sliding bin as well. 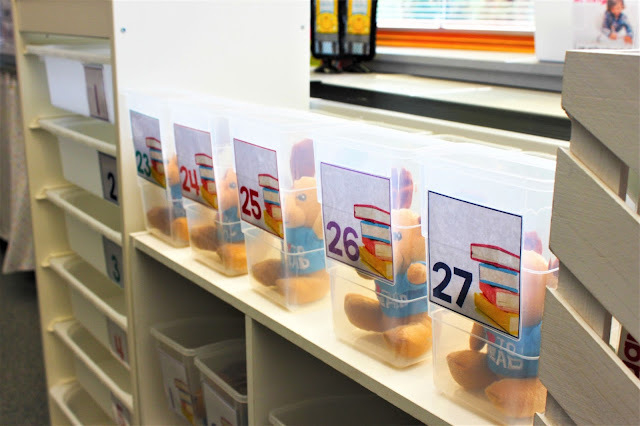 We have extra bins for our independent reading books. These clear bins are from Oriental Trading. We keep them spread out on shelves all around the room too! All of our bins have simple number labels so they can be used year after year. I love personalized things, but I just don't have time to recreate oodles of labels each year! At the beginning of the year, I put a piece of painters tape on each drawer and wrote the name of kiddo who was assigned that number. When everyone knows their numbers, just peel off the tape! There's also a spot for community supplies with clear labels. The kids can get out these supplies and clean them up without help from me. I have some good news and some bad news. The bads news is that if you poke a ball chair with a pointy pencil it really will pop. It doesn't pop like a balloon, but it quickly deflates so whoever is sitting there will slowly start sinking to the floor. 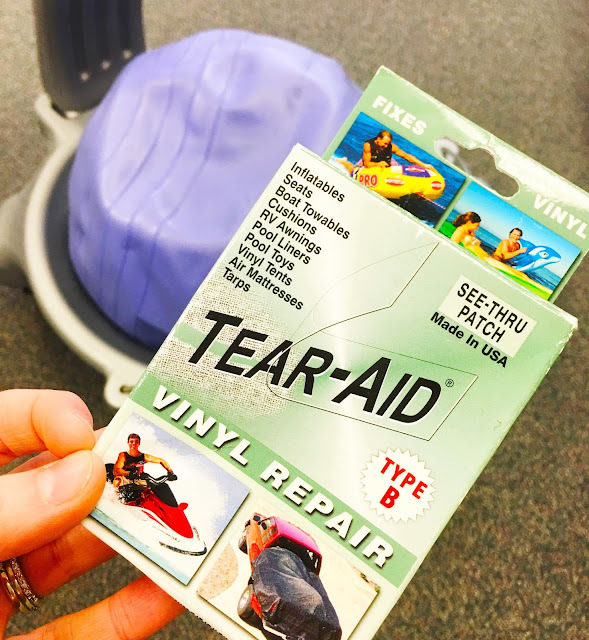 The good news is that you can repair it using a Tear-Aid Vinyl Repair Kit . These heavy duty patches are made to be waterproof and they work well for patching ball chairs. And just a little more bad news, if you pick or peel the patch, the chair will deflate again. We have learned all of these lessons this year. I also learned you can order Ball Chair Replacement Balls so there's always that option too! Flexible seating does require....ready for it....flexibilty. Don't run away Type A friends- you can do this! 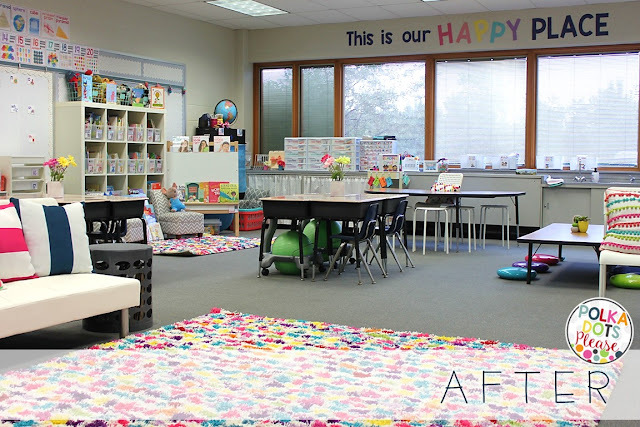 I have rearranged tables and moved rugs throughout the year to fit what we need. I am already planning a new reading nook to try before the end of the year (more on that later). I have gotten some new seating options for next year too! Even if we are always moving, I know one thing that won't change- we are sticking with flexible seating! When I am planning new classroom games, I am always looking to get the most bang for my buck! I try to create activities that I can use for lots of different skills. This way I only have to teach the game once, but we can play it again and again! Who Will Get the Last Word? is one of my favorite games! 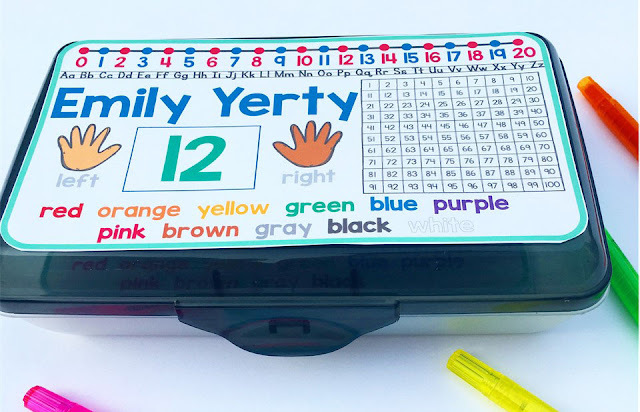 You can use it for spelling, vocabulary, sight words, or even math. It is an easy game to prep, and it really keeps your kiddos engaged! Before playing the game, you will need some teacher cards. I use a Sharpie Fine Point marker and index cards to make my teacher cards. On each card, write down one word. 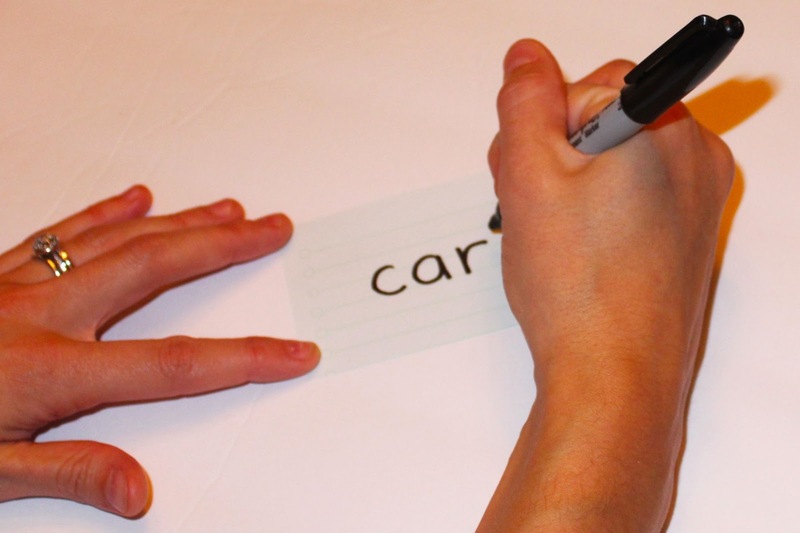 For example, if you are learning a new spelling pattern, you will need one card for each one of your new spelling words. 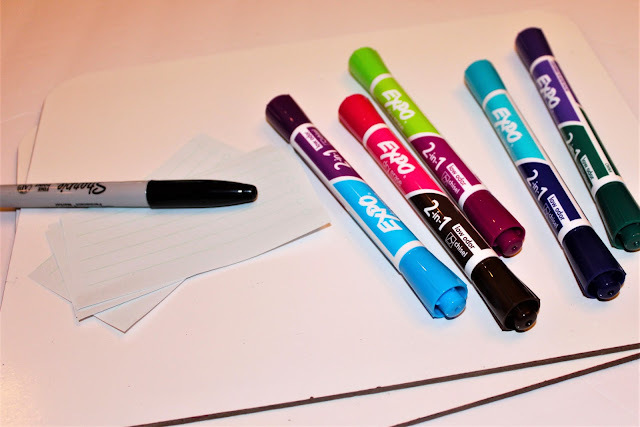 When it’s time to start playing, each kiddo will need a dry erase board and a EXPO 2-in-1 Double Sided Dry Erase Marker. 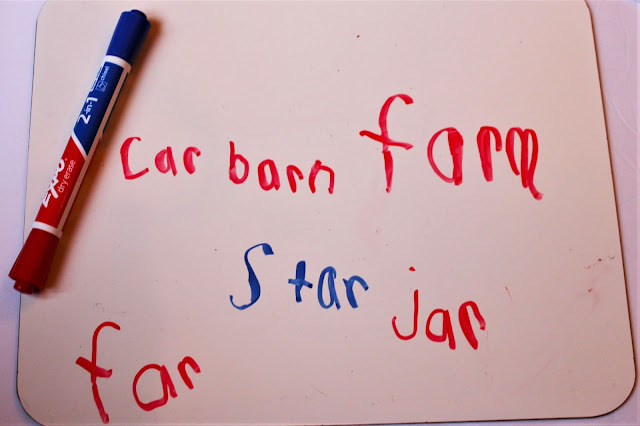 You will show them all the words on your teacher cards, and they will write them on their dry erase boards. 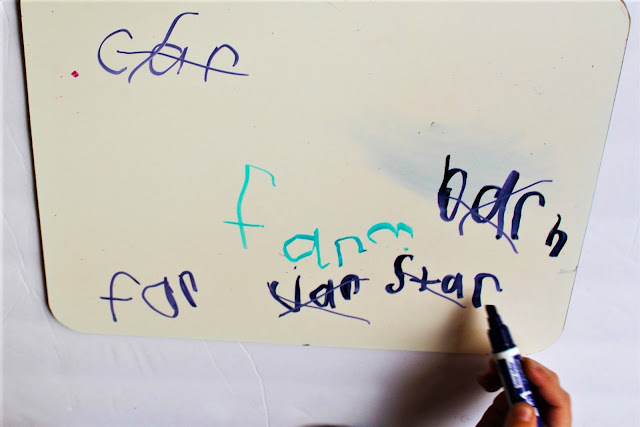 They will use one color to write all the words except for ONE! They will choose which word they think will be the “Last Word” and write that word using the opposite side of their markers. 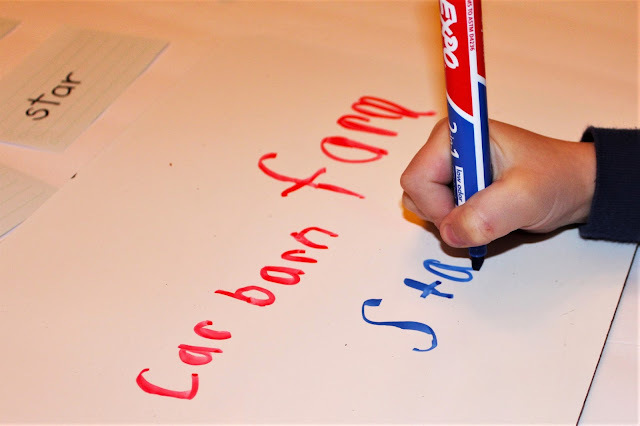 Make sure they only pick one word to write with a different color! 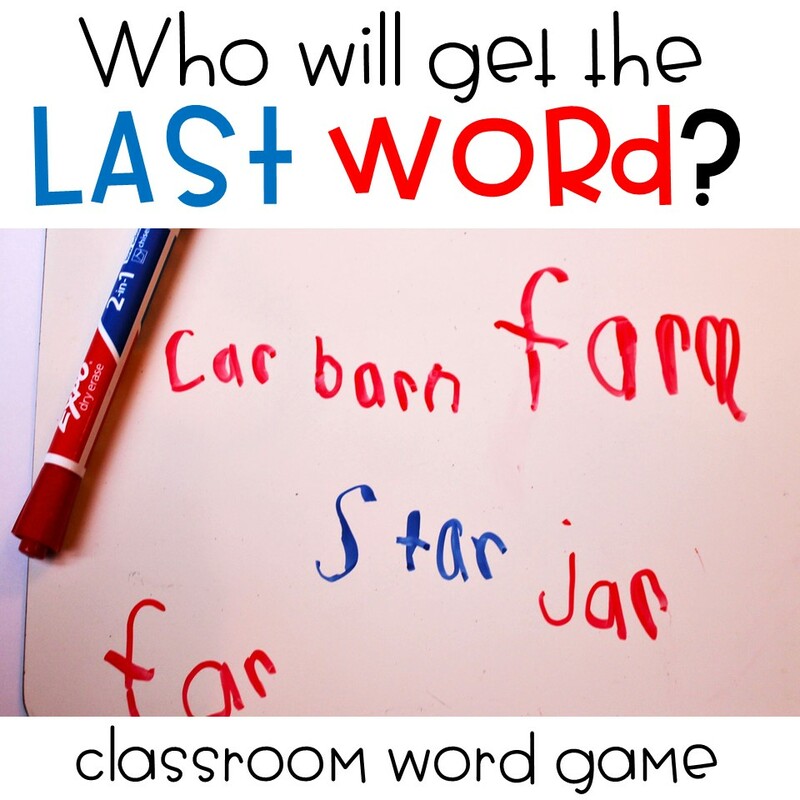 It should be easy to see which word they picked as the “Last Word.” Remind your kids that they may not change the color of their words once you start the game. 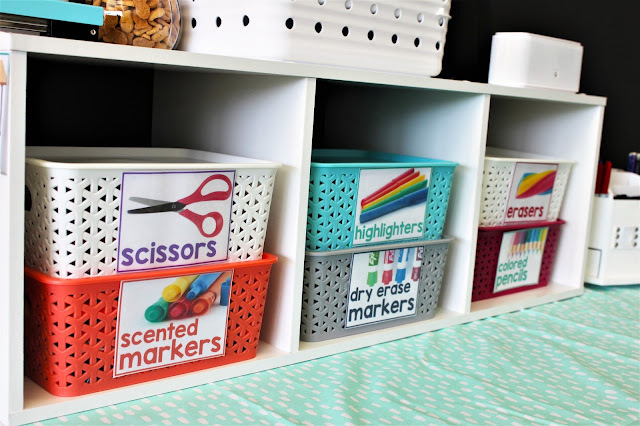 Once the kiddos have their boards ready, collect all the cards and put them in a cup or basket. Pull out the cards one at a time and give them a clue. If you are practicing a spelling pattern, you might say, cross off “s-t-a-r.” Keep giving clues until you just have one card left. The children who wrote the “Last Word” with the different color are the winners! You can give them a little treat or reward like stickers or mini-erasers. Once you know how to play, it’s fun to play during lots of different subjects! 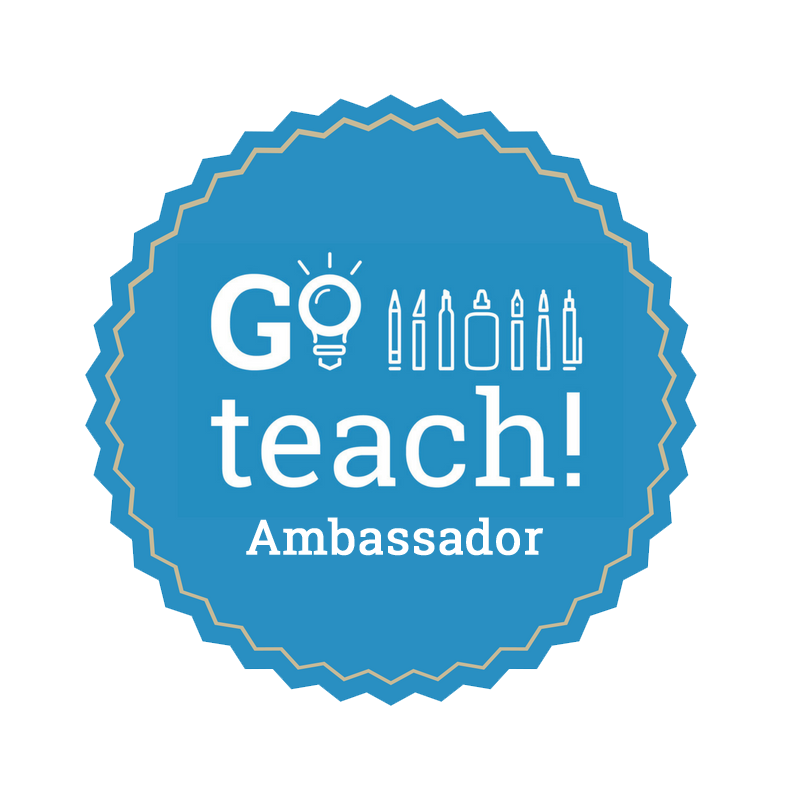 For more amazing ideas from teachers, follow Go Teach! Go teach! is an amazingly loud and incredibly proud new community created to inspire, empower, and support teachers like YOU! 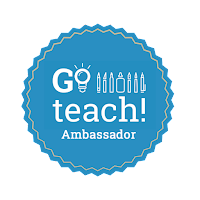 By joining go teach! you’ll connect with other teachers around the country. And receive fun, inventive projects you can use in the classroom. Thank you Go Teach! for sponsoring my post! All opinions are my own! 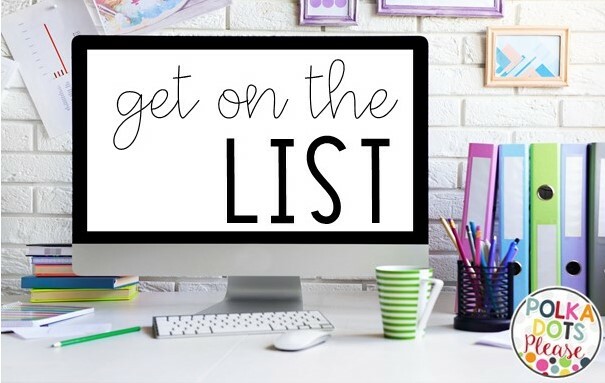 SIgn up for teaching tips, tricks, & FREEBIES you will love! From Daily Five Dropout to Center Success!